Vancouver, Canada – February 1, 2018 - Aztec Minerals Corp. (AZT: TSX-V, OTCQB: AZZTF) has intersected long intervals of porphyry gold (copper, silver) mineralization including shorter intervals of high grade gold mineralization in the initial results of its Phase 1, 15 hole, 3,000 metre (m) drill program at the Cervantes Project in Sonora State, Mexico. 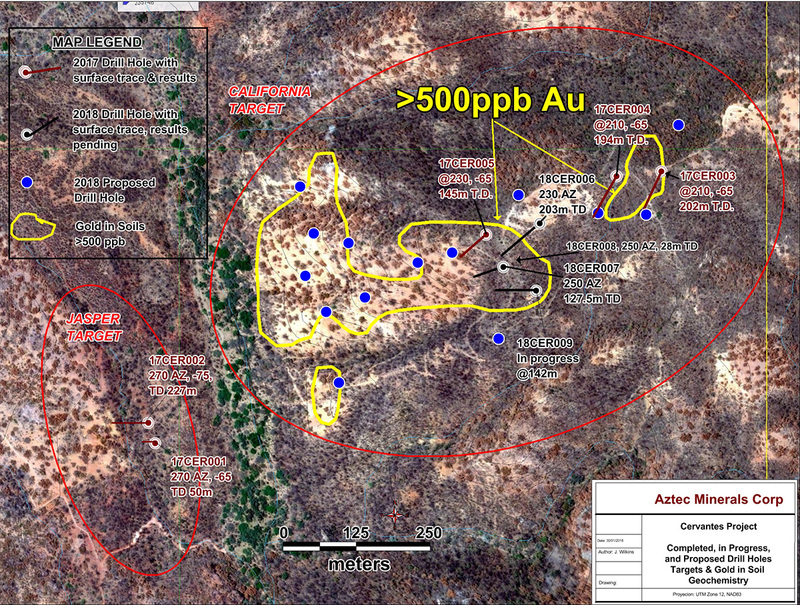 Joey Wilkins, CEO of Aztec, commented: "These positive results from three of the first five drill holes of our Phase 1 drill program confirm that the California zone has excellent bulk tonnage porphyry gold (copper, silver) potential at Cervantes. Holes 3, 4 and 5 were drilled to test a small part of a large surface geochemical gold anomaly on the hill that forms the California zone (http://www.aztecminerals.com/_resources/Jan30_2018-DH-Map_Cerv_Final.jpg). “As expected, we intersected gold oxide mineralization where the copper has been partially leached out as well as mixed oxides-sulfides transitioning to sulfide mineralization at depth. The entire California zone is underlain by a large, strong IP chargeability anomaly from 100 m depth down to at least 500 m that could represent the heart of a porphyry gold (copper, silver) sulfide system. Brief hole-by-hole descriptions follow below. 15.85-42.5m Polymictic Breccia composed of hornfels sediments and quartz feldspar porphyry, hematite-goethite matrix filling. Hole was lost due to broken ground and fault gouge. 0-194.0m QFP, goethite, hematite, quartz veinlets and silicification, manganese oxide, sparse siderite, minor quartzite fragments, Faulted Zones and Intrusive Breccia, pyrite as matrix and disseminated, partly oxidized to hematite and goethite, sericite, clay, silicified with quartz-calcite veinlets, minor patches of Hornfels, Rhyolite, Aplite, terminated in Polymictic Breccia, Hornfels. Joey Wilkins, B.Sc., P.Geo., President and CEO of the Company, is the Qualified Person who reviewed and approved the technical disclosures in this news release. All core samples were split in half, placed into plastic bags, labeled with sample number, closed with zip ties, and placed in rice sacks. Samples were typically collected in 2.0m intervals with occasional exceptions of 1.5 or 3.0m intervals. Blanks, duplicates, and certified standards were inserted into the sample stream and subsequently reviewed without any outliers or abnormal results. The samples were delivered to Bureau Veritas Laboratories in Hermosillo and analyzed for gold using a 30gram sample by fire assay fusion with AAS finish. Samples were shipped to Vancouver and analyzed with a 0.25gram sample using 4-acid ICP-MS providing analysis on 45 elements. The Cervantes Property is held under an option to purchase agreement with Kootenay Silver Inc. (TSX-V:KTN) whereby Aztec can acquire up to 100% interest in the property in two stages. Additional information can be found on our website. This news release contains “forward-looking statements” within the meaning of the United States Private Securities Litigation Reform Act of 1995 and “forward-looking information” within the meaning of applicable Canadian securities legislation. Such forward?looking statements and information herein include but are not limited to statements regarding Aztec’s anticipated performance in 2018 and the future, including receipt of regulatory approval of the Option Agreement, the exercise of the option on the Tombstone properties, the planned exploration activities on the Cervantes and Tombstone properties, receipt of assay results from drilling on the Cervantes property, the completion of further drilling on the Cervantes property, and the timing and results of various activities. The Company does not intend to, and does not assume any obligation to update such forward-looking statements or information, other than as required by applicable law.